Are you a memorabilia collector who would like to own a little piece of Vikings football history? Are you also a disgusting person? Then you should head on over to this here auction website and place a bid on one of the many Metrodome bathroom troughs that are currently up for sale. 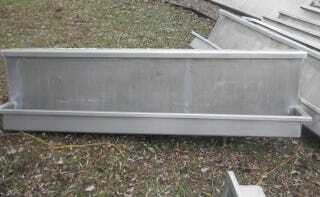 The current bids on all the troughs are hovering around $60, and the auction site describes them as "Great for livestock feeders or beverage coolers." I mean, yeah, I guess they would be great for that, but you can believe that your cows are going to be side-eyeing you if you make them eat out of an old piss receptacle. And do you really want to be the barbecue host that has to say, "Oh that? That's a thing that literally hundreds of thousands of people have pissed in," when your neighbor asks you where you got your cool new beer cooler from?